cooking, food, French toast; B & B French toast, leftover bread, Recipes, wasting food, Whatever Happened to Dinner? I received an email the other day that did a mother/author’s heart much good. I was very proud of Doreen’s improvisation and thrifty desire to not waste food, especially on a graduate student’s limited budget. Here’s the original recipe as shared by Jodi Nisly Hertzler, just as good in April for a Saturday morning breakfast, but that you need to prepare the night before. Hence my usual “Saturday Bake Something” post on Friday. Or halve the recipe like Doreen did. 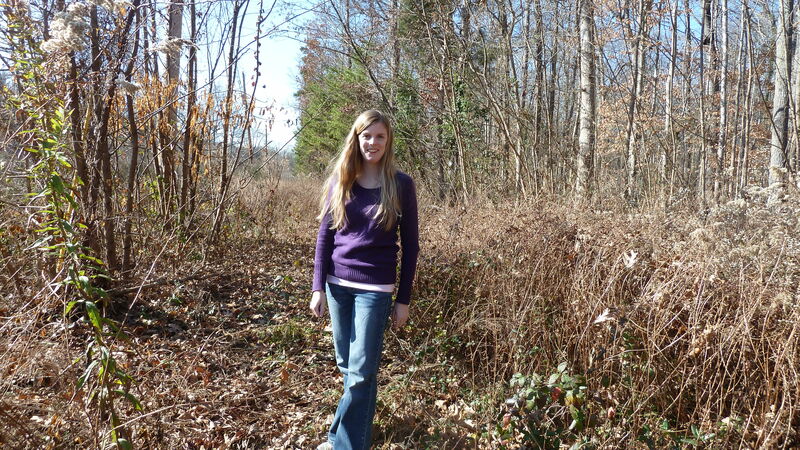 Doreen in her element–as a grad student studying urban ecology. P.S. The first time Doreen made this for us at home we purchased the challah (traditional Jewish) bread to use in the recipe, which Jodi mentions in the recipe instructions below. It is a slightly sweeter bread made with eggs which goes well with the French toast idea. But French bread is usually cheaper and easier to find. And P. P. S. S., the Whatever Happened to Dinner book is on sale for 30 percent off until May 8, in time for Mother’s day. See bottom of recipe. 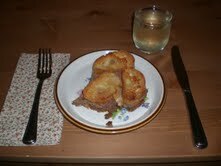 This dish is a specialty of a bed and breakfast that my husband and I visited when we lived in Oregon. We returned the following year, and I requested the same dish—it was that good. Rich and decadent, it’s perfect for a holiday brunch. Even better, it’s deceptively simple, and all the preparation is done the evening before, so all you have to do is pop it in the oven the next morning. I strongly recommend using challah in this dish, if you can find it. Option: Leave out the nuts and fruit for a simpler dish—that’s how it was originally served to me. In a small, heavy saucepan, melt butter with brown sugar and corn syrup over moderate heat, stirring until smooth. Add the nuts, cranberries, and apples, and stir to coat. Pour into a 9×13 baking dish. In a bowl, whisk together the eggs, half-and-half, vanilla, and salt until well combined, and pour evenly over the bread. Refrigerate at least 8 hours and up to one day. Preheat oven to 350° F/ 180° C and bring bread to room temperature. Bake uncovered, in middle of oven until puffed and edges are golden, 35–40 minutes. Makes 6–8 servings. From Whatever Happened to Dinner: Recipes and Reflections for Family Mealtime, Herald Press, 2010. Beginning April 22, Finding Harmony Blog will feature five guest posts as excerpts from a new book, Fifty Shades of Grace: Stories of Inspiration and Promise, published by Herald Press (April 17, 2013), for which I served as managing editor. I wrote about that process on the Mennobytes blog in February.